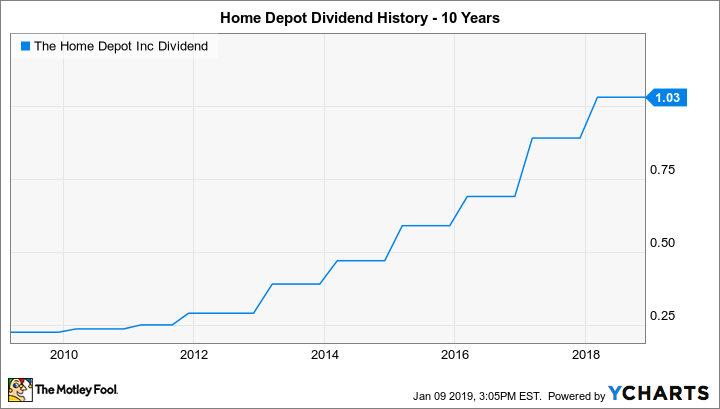 Will Home Depot Raise Its Dividend in 2019? The home-improvement giant saw a rare share-price decline last year, but dividends are still looking strong. The housing market has recovered nicely from the bust of the mid-2000s, and Home Depot (NYSE:HD) has been a big beneficiary of housing's rebound. The home-improvement retailer always has been a magnet for do-it-yourselfers, but more recently, Home Depot also has embraced professional contractors looking for access to the retailer's wide array of affordably priced products. Home Depot also has done a good job of treating investors well. Not only has its share price risen dramatically, but it's also built up a respectable dividend history. With the company looking to make it an even decade of annual dividend increases in 2019, will Home Depot make good on its full potential? Below, we'll look more closely at Home Depot to see whether higher dividends are in the cards. Home Depot has paid dividends for a long time, but it hasn't always been very important for the home-improvement retailer to return capital to its shareholders through quarterly payments. Typically, Home Depot gave investors regular increases in the mid-single-digit percentages, with a long break in the late 2000s in the immediate aftermath of the housing bust. Yet in the 2010s, Home Depot made up for lost time. Annual dividend increases in the 15% to 35% range became par for the course, and that led to a dramatic uptick in the total amount of money that the retailer paid to its shareholders. Early last year, Home Depot made its latest move, taking the dividend up from $0.89 per share to its current $1.03 per share on a quarterly basis. That was a 16% boost. The reason for the change has to do with deliberate strategic moves from Home Depot. The company boosted its target for the percentage of earnings that it pays to shareholders in dividends in the early 2010s, taking it from 40% to 50%. That prompted the big gains in dividend payments that investors received back then, and strong earnings growth also helped support the rise in the quarterly payout. Can Home Depot keep growing? In light of a tough year for the stock, it's reasonable to ask whether Home Depot's best growth years might be behind it. But CEO Craig Menear and his team have a lot of ideas for where the home-improvement retailer can find areas for its own corporate improvement, and despite early signs of success, there's further to go. One such initiative is the omni-channel effort that the company calls One Home Depot. As recently as just a few years ago, many thought Home Depot was immune to e-commerce competition. That's because the nature of its products made remote purchasing and delivery more of a challenge than with other types of retail goods. Yet that's proven not to be the case, and Home Depot has responded by encouraging online sales through a combination of innovative website design, logistical excellence in managing inventory, and making improvements to the in-store shopping experience. All told, revenue through its online channel was up 28% in its most recent quarter compared to year-earlier levels, and similar efforts to drive traffic through ship-to-store and in-store pickup options showed strong traction, as well. A rising commitment to professional contractors and other home-improvement specialists, which Home Depot simply calls Pro customers, also has been important. It's these customers who e-commerce specialists are most eager to poach, but Home Depot's ability to obtain and deliver products quickly and efficiently to the Pro customers who need them is a key competitive advantage that pure e-commerce players will have trouble matching. Earnings growth so far in fiscal 2019 has been substantial for Home Depot, and that should give the company the latitude to continue to boost its dividend early in the calendar year. Yet a key question is where earnings growth will come from in fiscal 2020, as investors see a dramatic slowdown in growth rates to only about 5%. I still think a boost to $1.20 per share on a quarterly basis, which would work out to a 16.5% increase, is most consistent with past practice. However, any concerns about future growth rates could lead Home Depot to slow the pace of its dividend growth from past levels -- and if that happens, it could be the first warning sign that the retailer sees tougher times ahead.